The election of a European candidate for this important organisation demonstrates our leadership in the global world of renewables. 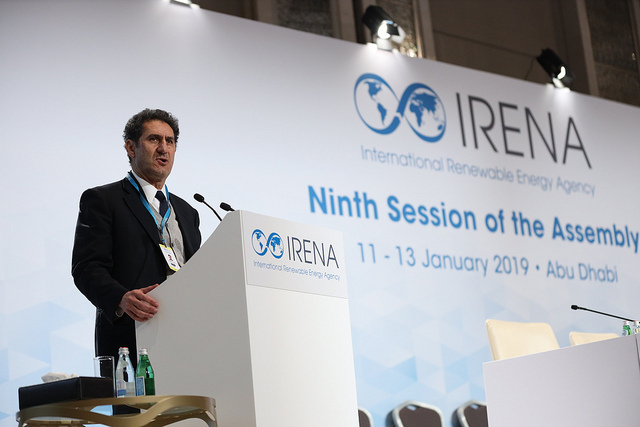 I am confident that Mr La Camera is the right person to lead the International Renewable Energy Agency in the next phase of renewables deployment worldwide. Mr. Francesco La Camera is currently the Director of International Cooperation at the Ministry of Environment in Italy. He is expected to start as the head of the organisation in April 2019. The International Renewable Energy Agency is an intergovernmental organisation with 160 member countries. The organisation's role is to support the acceleration of renewable energy throughout the world by providing technical assistance, policy support and new data and analysis to governments. In the European Union, the International Renewable Energy Agency played an important role in the assessment of Europe's cost-competitive potential for renewables in 2030. The election took place in the context of the 9th session of the annual Assembly of the International Renewable Energy Agency in Abu Dhabi, at which Dominique Ristori, Director-General for Energy of the European Commission represented the European Union.